Break the routine! Improve your French with theater games and see your imagination at work! Come and join Céleste for this monthly Theatre workshop! 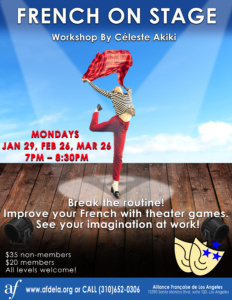 Every last Monday of the month, come at the Alliance Française to practice your French in a new and fun way through theater exercices! Joie et bonne humeur seront au rendez-vous de ce nouveau Workshop!